The 74th Season (2019/20) Application and Membership will open in June 2019. The following general guidance may help you to plan for a future season. 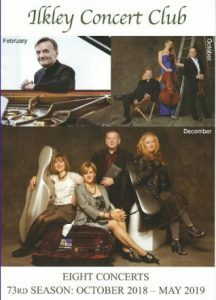 Tickets for individual concerts can almost always be obtained – click here for details. You can obtain a Brochure, which includes the Booking Information and a Booking Form, from local libraries, the Ilkley Visitor Information Centre. If you are a current Member, ensure that you re-apply on or before the priority booking date, which is notified in the Brochure for each season and which is available on this website (see Home Page). New Subscribers should apply as early as possible, because available seats are allocated in order of receipt of allocation and there may be an insufficient number of seats to meet the full demand. Unsuccessful applicants gain some priority if they re-apply again for the following season.